In one of Botswana's unique corners more than 90,000 acres of exceptional game land has been set aside for this reserve. 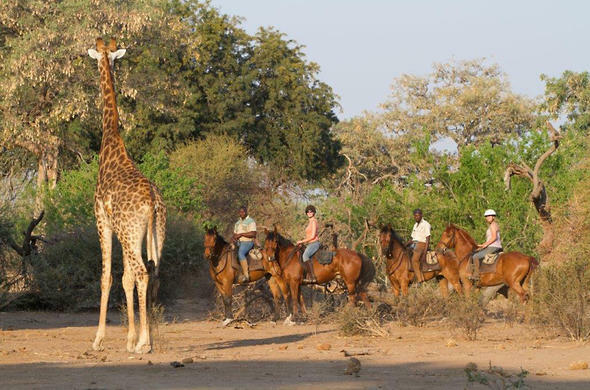 The Mashatu Game Reserve, originally known as the Tuli enclave is a remarkable wilderness of savannah, riverine forests, marshland, open plains and sandstone cliffs. In the remote eastern corner Botswana, in the Tuli block at the confluence of the Limpopo and Shashe rivers. It is the largest of the Rattray Reserves. Mashatu Game Reserve with its rugged, unspoilt African landscapes gets its name from the massive Mashatu tree Xanthocercis zambesiaca which occurs throughout this vast expanse of privately owned land. Mashatu Game Reserve is a sanctuary to the largest, single population of Elephant on privately owned land. The population on Mashatu alone, is estimated at approxiametly 700. Some of Africa's other giants are the Baobab tree, the Eland, the Ostrich, the Kori bustard, and the majestic Limpopo River. The wildlife experience at Mashatu is very personalized with dedicated, experienced Tswana rangers and trackers, enthusiastic to show you their world. The four-wheel drive safari vehicles set out at late afternoon and again at early morning in search of the different species which inhabit the reserve.Over 350 species of birds can be spotted, while the cheetah, zebra, giraffe, eland, impala, steenbok and the breeding herds of elephants are encountered out on the plains. There is also a diverse variety of fauna and flora which flourishes throughout the year. The climate over most of southern Africa is mild and pleasant. Hot, humid conditions are usually experienced in the Tuli region. Heavy summer thunderstorms in the late afternoon and evening may be experienced. However, they are usually of short duration. Rainfall occurs mostly during the summer months (October - March). During the winter months (May to September) very warm clothes including a windbreaker (anorak) are essential. Mashatu Main Camp is well-known for its hospitality. Enjoy supper around the fire in the lala palm boma under a starlit sky overlooking the flood-lit waterhole. Relax around the pool or under the thatched verandah, and experience the hospitality and service for which Mashatu is renowned. Mashatu is a haven of supreme 'bushveld' comfort and service, blending in pleasantly with the savannah that abounds with wildlife. There are 17 rooms at Mashatu Main Camp, of which 12 bedrooms are insect-proofed. French doors open onto a shaded veranda surrounded by Africa's flora and faunas.A double and extra large single bed, complete the well-appointed superior rooms. The 5 standard rooms located within the central area of the camp consist of 2 extra large single beds, and 1 bathroom en-suite. Mashatu Main Camp hosts therefore thirty four guests. Mashatu Tented Camp lies in the remote northern area of the reserve. With never more than fourteen guests, this idyllic refuge offers accommodation in the form of seven twin tents. Although a bit rustic in character every facility is provided. The tents are insect-proofed, have comfortable beds and each has an en-suite shower and W.C. facility. There is an open-sided thatched deck where meals are served, and a traditional boma for intimate campfire dinners. This camp also contains a plunge pool. Your total comfort is the priority of your hosts. While on game drives, or mountain biking safaris, you will be taken care of by your ranger and on your return to camp, the staff will happily attend to your every need.